Whew, the wind died down last night and was completely gone this morning! We were glad we didn’t have to deal with sand and dust blowing into our tents all night the way it was before we went to sleep. We got going about 6:40am. Both our bodies were definitely feeling it from yesterday’s humbling heavy carry, boulder scrambling, and jarring downhill leaps from rock to rock. I was pretty much sore all over. My bad ankle (that had surgery on a severed ligament in 2006) was not happy with all the weight from yesterday and again today, so it voiced its displeasure all day. It was in the 40s much of today and thankfully not very windy. Clouds gathered all day and we expected temps to drop, but they didn’t until the afternoon when it was just 40 degrees. It was good with the sun, but it could turn quickly when the wind kicked in and a cloud would block the sun. I kept my down jacket on most of the day and it was fine. Had to use the iPhone for photos all day since my Panasonix Lumix has stopped working in the cold for some reason. We had a very relaxed and plain day and that was a surprise after yesterday. 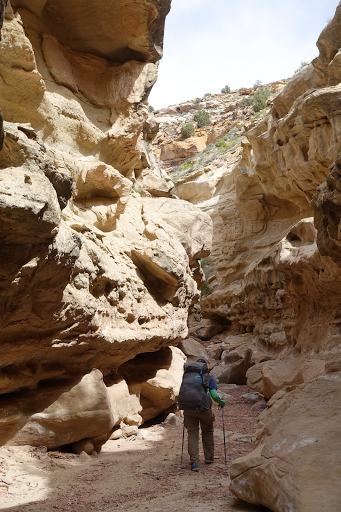 We knew we were headed into a full day with canyon hiking and were prepared that it could be as congested with boulders as Monday Canyon was yesterday. This morning, we did a few more miles in Rogers Canyon and it thankfully opened up a bit so we could get a rhythm going. 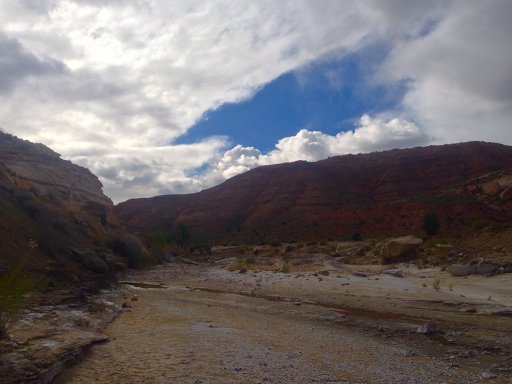 From there, we spent the rest of the morning hiking up the slight incline of Navajo Canyon. We were stoked to find that much of Navajo had flat, hard clay to walk on and we got many miles in early. I even listened to more of The Interestings audiobook. There was about an hour of climbing up through boulders that got us worried that we’d be knocked back down to the 1mph pace of yesterday, but it soon cleared and was a cool tighter canyon the last mile or so. 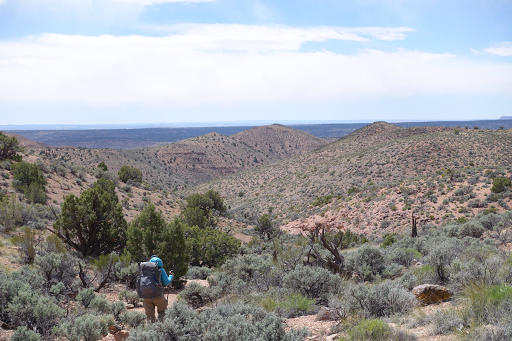 After Navajo Canyon, we entered Reese Canyon, which was also smooth sailing and uneventful, but a nice view up top as we hiked down. It’s really just been two days of canyons and it makes a big “W” when you look at it on a map. We are hiking to the town of Tropic over 145mi and I think we could have driven there in 40mi. Not the most direct route, but that’s the Hayduke. It’s not about the destination and we have some cool narrows canyons that I’m looking forward to later this leg. 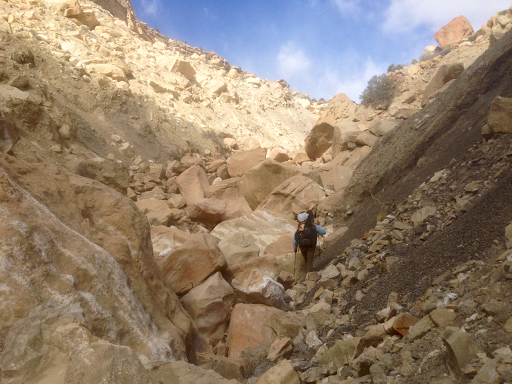 Next, we entered Last Chance Creek Canyon. 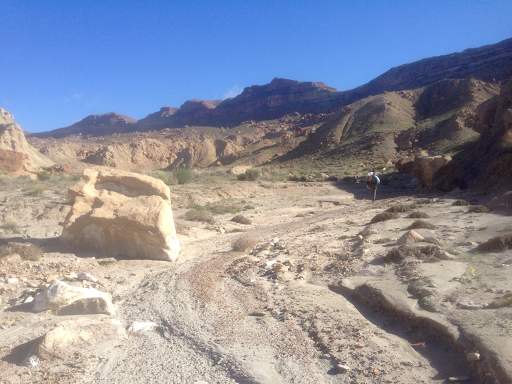 A very wide canyon with clay-like terrain that can be deceivingly slick if you don’t steer clear of muddy parts. It can be tricky and we were constantly testing with our poles to make sure we had solid steps. Water will appear sporadically in small potholes or stretches, but it’s not great and is pretty alkaline. The whole floor of the canyon is quite white from the minerals in the water that no longer covers the ground. The clouds were gathering more, temps dropped to 40 degrees, and the wind gusts were more frequent and cutting at times. We wanted to camp with a water source and somewhere protected since there’s a 30% chance of rain/snow. We made many more miles than we expected going over 20mi and we were tired from yesterday, so we started looking for sheltered camp spots early at 6pm. 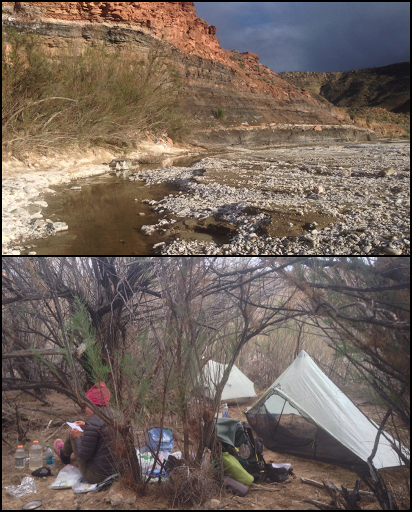 Water was getting more sporadic, so we found water and then settled for camping nearby in a bunch of fully grown tamarisk. We are NOT fans of tamarisk, which seem to grow like strong, tall, thick weeds along every bank of every stream we come near or need to follow. Well, tonight, we hope this cave made of tamarisk will protect us from whatever weather may come. We just barely fit in here and it seems to be a regular cow hangout. Our water source is quite alkaline too, but that’s normal out here. The sky is clear, there is no wind, and bright stars right now, but earlier as we had dinner and setup our tents, there were moments of each snow flurries and light hail that covered the ground briefly. I washed off the zipper of my tent and it worked for a moment and is now back to not working, dang. I’m glad I have the umbrella to prop up in the vestibule and keep the warmth in. Today was the first day that we officially saw no one at all. We had two other days where we didn’t see anyone, but did see other Haydukers.